Bjergsen, the Mid laner for TSM, gets a pentakill against Echo Fox. Games of League of Legends are fast-paced and exciting, and -- for new players or viewers -- they can be very confusing. League of Legends is a game in the Multiplayer Online Battle Arena (MOBA) genre. Two teams, consisting of five players each, compete against each other to be the first team to destroy the opposing team's Nexus. In their way stand not only the opposing team's 5 players, but also a number of computer (AI)-controlled units, called minions. Players themselves control units called "Champions", and they must destroy enemy "Towers" and "Inhibitors" in order to get to the Nexus. Destroying these buildings grants players in-game resources that make their champions stronger. Once a nexus is destroyed, the game is over and everything is reset for the next game. During the early parts of the game, known as the "laning phase", champions try to kill minions in order to gain experience and gold. The experience is used to level up a champion's abilities and base stats, while gold is used to empower champions through items. At a certain point in the game, when teams feel like they are strong enough, they will group together as a unit of four or five to fight each other (fights with lots of people involved are called "teamfights") and kill towers. If a team loses all the towers and an inhibitor in one lane, their Nexus becomes vulnerable. If a team kills the enemy Nexus, they win the game. There are a couple things you can look at. Between champions that are laning against each other, the one with a higher level or more minions killed is usually ahead. Total team gold and towers taken, both of which are displayed in the spectator overlay, are usually good indicators to tell which team is ahead. If one team is ahead by 5k gold at 20 minutes, that's a pretty big deal. If a team is ahead by 10k gold at 30 minutes, that's a pretty big deal. If the game is still going on at 50 minutes, it's harder to tell. Positioning on the map also plays a part. If the champions are all near the blue team's base, the red team is probably ahead. If the champions are all near the red team's base, the blue team is probably ahead. One other really important thing to keep track of is the current state of Dragon buffs. The team that managed to acquire more Dragon buffs is usually in the lead, although this also depends on what kind of buff it is. Usually, the casters will go into this in more detail, often explaining which Dragon buffs enhance certain team compositions. Teamfights can be very confusing to watch if you don't already have a very good understanding of how the game works. So if you're completely new to League of Legends, you should do just two things. Figure out who each team's Carry Champions are. Watch to see which team's carries die first. Generally, the team whose carries die first will lose the teamfight due to a lack of consistent damage. Of course, League of Legends is a lot more complicated than this, and once you understand more of the game it gets extremely exciting! The pages in the introduction will help you get an idea of the mechanics that govern gameplay. Once you understand that, head on over to the other tabs to learn the things you will need to, in order to have a deeper understanding of the stream. If you don't mind not knowing why things are happening, and only want to be able to understand the stream on a basic level, that's fine! You can still enjoy Worlds, or any other tournament. In this case, don't worry too much about reading everything in the introduction, just look at the pages in the other tabs, and consult the glossary (control+F is your friend) if you're ever unclear about a term. 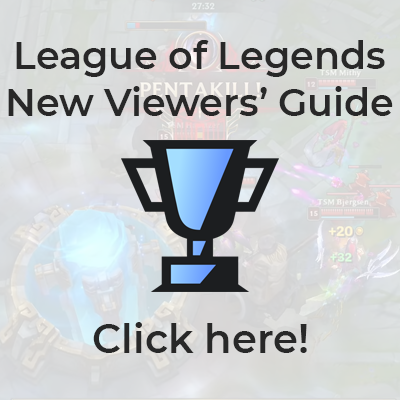 And if you're familiar with other MOBAs, such as Dota 2, you'll probably find the following pages most useful in explaining League-specific concepts: Unit Attributes, Vision, and some important items. Also read about the metagame. Another good way to learn some of the gameplay mechanics is to watch some popular League of Legends streamers. Pick one from among the top League of Legends streamers and try and find someone who is explaining their gameplay! It won't be quite the same as watching esports since you are seeing a single player's perspective instead of an observed view of the entire map, but it will get you used to some of the champions and what they do. Wondering what teams to root for? Here's a bunch of articles, interviews, and other content centered around the teams and players at Worlds. You can also click here for a list of all of the teams, with links to their infopages and their players' infopages. The text in this section was primarily written by River, with graphics by Hova. Special thanks to James, Ling, and Michael! Thanks to Akura for his update of the flashcards and other sections, and to Ragaga for several updates, as well to everyone who helped with taking updated screencaps! Thanks to Daniel Jacob Kulick for the 2017 midseason update! Thanks to Aircrou10 for the 2018 midseason update and Ragaga for the end of season update. This page was last edited on 28 September 2018, at 23:33.